Plenty of horror (and film) fans hold James Whale’s Bride Of Frankenstein in even greater esteem than his 1931 original. But the series continued past that high-water mark, and the less-known third installment, Son Of Frankenstein, takes the story in both new and familiar directions. The threequel lacks Whale’s depth of feeling but boasts an all-star horror cast. With Karloff’s final appearance as the Monster, it could be considered a trilogy-capper, but Son Of Frankenstein also plays like a soft reboot, existing in the same timeline as the first two films while adding a number of new characters like Wolf Von Frankenstein (Basil Rathbone), son of the original’s Henry, and Ygor (played by Karloff’s rival, Bela Lugosi), a variation on past hunchbacked assistants. The addition of a grinning, almost lupine Lugosi also shuffles the series’ relationships, placing Ygor and Wolf in a power struggle for control of the revived Monster, who quickly reveals a more natural affinity for Ygor. The torch-and-pitchfork crowd also get a stronger voice this time around; the movie opens with a town council lamenting that the post-Frankenstein village has become “forsaken, desolate, shunned by travelers” (the movie also slips in a joke about the tendency to conflate the mad scientist’s family name with the Monster itself). They even try to solicit undercover information from Ygor, following an unsuccessful offscreen attempt to hang him for his past crimes, before descending into the usual angry, vengeful mob. Rathbone’s Frankenstein initially seems levelheaded, musing about his heritage and inheritance to his innocent wife (Josephine Hutchinson) and son (Donnie Dunagan). But when he arrives at Castle Frankenstein, Wolf’s compulsion to vindicate his father’s work and restore his family’s good name takes over. His interest in mad science seems vague; the movie is more about settling past scores. In this arena, Wolf has a harder time than the scheming Ygor. 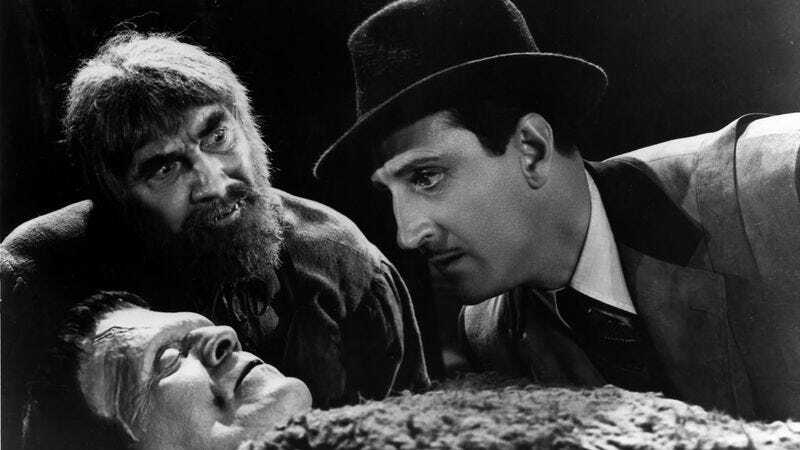 The new leading actors have fun playing up this contrast: Rathbone ratchets up his nervous desperation while Lugosi delights in his creepy manipulations. Despite some good kills and impressive, impressionistic production design, Son Of Frankenstein summons less intensity than its predecessors—and even at a brief 100 minutes, it runs almost 50 percent longer than either of them, to no great effect. It’s unmistakably a sequel to better movies, but its self-conscious tweaking of the Frankenstein story has its own peculiar charms. Availability: Son Of Frankenstein is available on DVD, which can be obtained from Netflix, and to rent or purchase from the major digital services.